So, i believe that we had left off our story at the part where the glorious Deathwing had purged the filthy dark eldar from the Cthonic Sector. Our Next story takes us to a little piece of intelligence that showed us that the Ultramarines had recently assaulted a chaos held world near the eastern fringes, and as a result had captured an old warrior clad in black who spewed heresies about the noble Dark Angels. The Ultramarines had called for the inquisitions aid. But when the Ravenwing arrived to reason with the sons of Guilliman, they opened fire on the second company of the Dark Angels, wounding Sammael and wiping out 3 squads as well as 12 Land Speeders. This was not to be taken lightly by Belial, who immediately departed upon his battle barge "Sword Of Caliban" to the east. So the game was 1 objective each, dawn of war. I won to deploy first and chose a side with some trenches, i deployed belial with his squad in there and another unit of termies near them. My objective was in that same trench. My opponent decided to go toe to toe with me and he deployed his objective exactly opposite of mine, but on the other side of the board. It was at this moment that i realized he had only 2 options: either attack me and go for a win or stay back defending and hope to draw me, such is the outcome of games with 1 objective each usually. So he kept everything in reserve and said its gona come in on turn one. And so the game Begun. So , everything came in from my side of the board, and moved 6 inches, taking defensive positions around the trenches, once again i had clustered my termies around the middle of my side of the table. I knew that it was dangerous, as a vindicator with null zone can be a wicked combo. I hoped that night fight would save me in turn 1. I moved the Land Raider from the right flank and the dread from the left, mirroring my previous games tactical outlook. After some bad rolls, only 1 missile could see ....well nothing, because he had deployed nothing. In his turn 1 he brought everything on the board, the vindi, and 2 land raiders moved max speed and the rhinos moved as close to his objective as he could. He has some great terrain from his side, so his rhinos would always get either a 4+ or 3+ cover save. He tried so shoot with anything, but could see , due to it beeing dark! This was it, it was the turn i had to believe in the Lion and the Emperor the most to bless my brave warriors. If u did nothing, id get blasted with a vindicator blast, plasma cannons, and everything else his army had. Put in null zone and wed be looking at serious damage. And this was before he disembarked 10 terminators with a liby and marneus. I shot everything at the vindicator, and as nothing would penetrate or he made his 3+ cover saves (i could hardly see the vindi due to his tactical positioning of the land raiders in front of it) my last missile launches managed to penetrate and blew off its demolisher canon. I dont think i can explain the Euphoria that moment when you LAST missile launches penetrates and does something that a bunch of other shots could not do. How ever that did not mean i was out of the woods yet. I had clustered my forces around the trenches, but belial and his squad stood defiantly in front on them, they were to be my shield against the might of the 1st company of the Ultramarines. As i expected he moved up with both his raiders and disembarked all his units, he did his null zone, and the first shots started. His Tacticals las canon saw my dread shaken. His Multimelta from the redeemer saw my Land Raider Blown up, while his assault cannon killed 2 of belials squads termies (yes he had 3 rendings). While the plasma cannon took out 2 termies from one of my back squads. (god i hate null zone). He would then go on to assault Belials squad with Marneus and termies, and assault another of my squads with the Liby and termies. The combat was vicious. He managed to wound belial once, and kill another of belials squad, leaving only the standard bearer and apothecary alive. However we managed to kill one of his lightning claws. While the librarians and his termies took out 3 terminators from the squad they assaulted, leaving only 2 TH SS termies fighting them. With 4 major threats in front of me i had to think. I decided to ignore the 2 land raiders which could easily camp on my objective and try to wipe out his 2 termie squads. I assaulted Marneus and squad with 2 additional Deathwing squads from 2 sides. While a the dread and 1 more squad assaulted the libby. I still had 1 squad sitting on the objective with a chainfist in the case he chose to tank shock them. I shot his plasma rhino with this missile launcher and stunned it! Yay no plasma this turn. We went on in combat with his focusing calgars attacks with his power weapon rather then fists on a newly arrived unit from the right, he killed 4 of them. While his squad focus on belial and his squad but didnt do anything. His turn saw him shoot both Raiders at the single un-engaged termie squad and his lascannon from the rhino, ultimately killing 1 SSTH termie. I had only 2 more left in that squad. I was growing weary of this annoying shooting that made me re-roll succesfull invulnerable saves. Close combat saw him lose 1 THSS termie and 1 LC termie from marneus squad, and me lose 3 termies from my left squad that was engaged with marneus. The Librarian had killed of the initial unit he assaulted but lost 1 wound and 2 LC termies from the 2nd squad and the dreadnaught. It was impossible for me to believe that 10 Termies , 1 Marneus and 1 Libby were taking such a toll against 25 Deathwing. I guess thats how it is playing with a codex where youre librarians know more then 1 psychic power, and where those psychic powers are usefull for something other then making you laugh in misery. So shooting saw me shoot at his rhino again but he made his cover save. Combat saw me kill his termies off with marneus and leave marneus with 1 wound and strike after me, due to the fact that our Thunder Hammers are way better then the generic marines ones. The Libbys squad finaly lost its thunder hammers and was left with 1 THSS and the Libby. In his Turn i finaly killed of marneus , out of 16 Termies that entered that fight, only 7 survived. And i won the libby by killing the last THSS, he rolled 12 and fled from the field. I consolidated towards him. At this point i had only 2 chainfist, one was on my objective, the other was in the squad that had won marneus. I move up the dread, the remaining 3 man squad that won the libby. Belial and his 2 reaming solders and what ever is left of the squad that attacked Marneus from the left (viva la chainfist). I shoot some cyclones at his land raider but do squat. Then i run the dread and the termies from the left towards his rhinos. While belial and the chainfist squad assault the redeemer, sadly my opponent know how to play and had moved the land raider 12 inches. I hit on 6's and immobilise the redeemer. With Many thunder hammerhits and only 1 penetrating from the chainfist which blew off the multi melta. In his turn his libby runs back even more, but since null zone can still be cast while falling back (according to the TO) he casts it and wipes the left 3 man squad with shooting from both his rhinos tacticals. One of which had disembarked. Once again i curse at Null zone. This turn sees me loose 4 termies that are guarding my objective from the crusaders 12 shots from the crusader, its 4 assault cannon shots and its Multi melta. Funny thing is, the null zone rached only one of them and it was on the 24" mark. I could believe that after such a fierce fight i could lose it all due to null zone. This action made me split belial from his 2 remaining termies. They moved 6 inches back and ran another 6 inches towards the objective. But i could tell that it still wasnt within 3 inches to claim it. I assaulted the dread into the tactical that had disembarked. And after 2 combat phases made them run off the board. The Redeemer that was immobilized got wrecked this turn and his failed attempt to tank shock me with the vindicator saw it blown up. This was it, the roll of the century. If he rolled and it ended it would be maybe a draw if the dread was within 3 inches of his objective, if not id would be a loss for me. He rolled....and it was a side-cocked die of 5....i argued that we should keep it, but after what i believe was the fair call, the judge made us re-roll it. And it rolled a 6!!! The lion was truly smiling upon me this day. The remainder of the turn saw me get into the trenches with the last 2 termies of belials squad and greedily claim it. The dread vent on to stand on the enemies objective. And stun the rhino. I would then assault his cruasader with the chainfist and immobilise it in my turn, about 6 inches from my objective. Belial ran up to the dreadnaught, and i believe he was within 3 inches of the the enemy objective. Regardless in his turn, he disembarked his last squad and blew up the dread, however he could do nothing to belial who was contesting his objective. Game ended 1-0 in my favor with only a 160 victory point difference in my favor. PS: Im the guy in the red bandana :P please dont laugh! Once again we finished first. So the long wait proved to be a pain. Id go around looking at other games. I saw the tyranids lose from the 2nd ork player (one with nobs on bikes) , saw the blood angels win the imperial guard in a very close game. The 2nd dark player (not the one from my st game) lost to the ork player that played the nids (think he had 3 battle wagons filed with boys). 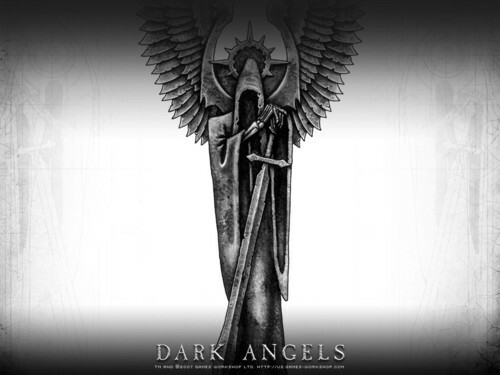 I dont remember if the ravenwing won the Dark Eldar that i played or not, but id like to think that he did :) Dark Angels one and all kinda thing! So game 3 had finnaly come and i was faced off with the only other player who had 2 wins with significant Victory point. It was the blood angel. The mission that we were gonna play was Kill points and spearhead. Il be honest with you, i dont quite know the list by heart because after some miscalculation by the blood angel players part it turned out he was playing with 10 or so more points then the limit allowed. Due to this fact his points were halved and he decided to concede his last game, giving me 2000 victory points. Regardless of conceding though, the scenario greatly put him at a disadvantage, were talking about an army with 22 kill points that faced an elite army with mostly S8 shooting and close combat of 9 kill points. Im not saying that he could not have won, only that it put him at a disadvantage. I had won this even with 3 wins, and near to 4000 victory points. The second place belonged to the Ork player with biked who i believe had claimed 2 wins and a draw? Or perhaps 3 wins but less victory points. While 3rd place went to the tyranid player who had 2 win and either a draw or a loss. It was a very fun event, with players that were polite and kind to each other, the shop was amazing, spacious and had its own bar! The TO was as fair as he could given the circumstances and did a great job. If i had a complaint it was that ... wait, i actually dont have one...thats odd ! Belial looked down on his mud encrusted gauntlets. How long ago had it been since he was entrusted with the leadership of the Deathwing? He remembered the exact number of days, due to his eidetic space marine memory, but he dared not mouth it aloud. "The Angels Gather on the other side of the ridge" Came Bellerophons voice from behind, his Standard Bearer. Belial smiled at this. The Angels he though, ironic how 2 of the greatest Legions, and he put emphasis on Legions, had come to this. After the retreat of the Ultramarines and the securing of the prisoner, the angels in red had come seeking answers. When they saw 2 loyal armies fighting, they immediately sided with the Ultramarines. It was no great surprise to Belial. He knew that few chapters trusted the Dark Angels explicitly, and even then they never showed it in public. "Our Red Brothers will lose no men this day Bellerophon" came a silent and authoritative voice from under Belials hood. "Word had reached me from orbit that, chapter master Azrael, explained the situation to the ancient leader of the Blood Angels. He has promised to withdraw his forces to avoid any more imperial lives beeing lost." This came as a relative surprise to Bellerophon. "He explained the situation to them?" To this Belial had no answer other then the one that he had given many times in his life. "He told them when they needed to hear"
Grats matey, you did well!